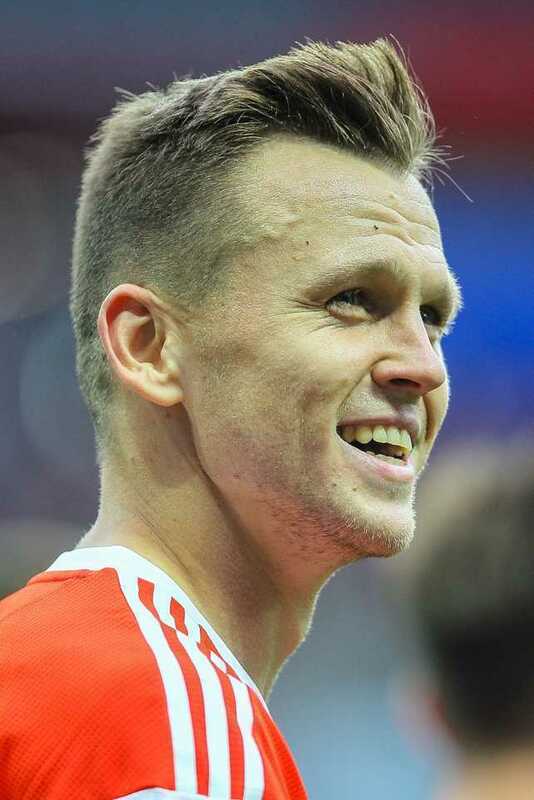 Denis Dmitriyevich Cheryshev is a professional Russian footballer who is popularly known as Denis Cheryshev, plays as a left winger for Spanish club Villarreal CF and the Russian national team. Denis Cheryshev was born on the 26th of December, 1990 in Nizhny Novgorod. From the childhood, he was pretty sure that he would become a football player in future. His father Dmitri Cheryshev is also a famous player of FC Dynamo Moscow. Denis followed his father and got fond of football. Cheryshev joined Real Madrid in 2002, being a junior; he played nine Segunda Division games with Real Madrid Castilla during the 2008/2009 season. For two years, Cheryshev played 61 matches and scored 11 goals from the reserve side. Cheryshev made his debut in division two on 17 August 2012, he played the full game against villareal but they lose the game with 1-2 scores. In September 2013, Cheryshev was loaned to Sevilla Due to the injury concerns, he played only four league appearances and then he joined Villarreal on loan for 2014/2015. Returned to the Santiago Bernabéu Stadium, Real Madrid on 19 September 2015. He scored his first competitive goal for Real Madrid on 2 December. On 1 February 2016, Cheryshev was loaned to Valencia until June. He scored 3 goals making 7 appearances for valencia. On 15 June 2016, Cheryshev returned to Villarreal on a permanent deal where he signed a contract until 2021.He scored 4 goals on 32 games in all competition during 2017/2018 season. Cheryshev is a Russian international player. He fails to score on his debut game against UNITED STATES with 2-2 draw on November 2012. In 2013 he played only one game with Russia. In 2014 he played 5 games with Russian squad but did not score a single goal. 2015 he played 2 games but didn’t score a goal on both games. Absence of more than two years, Cheryshev appeared for the national team on 27 March 2018 in a friendly match against France. On going 2018 world cup He made his debut in the competition on 14 June, replacing the injured Alan Dzagoev. He scored twice against Saudi Arabia in Moscow and made Russia win with 5–0 score. He scored his third goal in the tournament against Egypt, in a 3–1 victory. Russia made to the Round of 16 against Spain. Russia won against Spain on the penalty shootout. And made to the quarter finals. Now Russia is facing against CROATIA ON July 7 2018. Denis Cheryshev is popular both in Spain and in Russia But he is still a bachelor. Denis has kept his personal life and relations in secret.